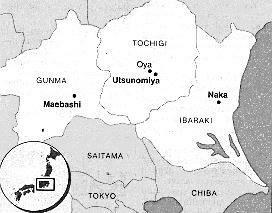 OYA, Tochigi Pref. - In the treasure hall of Oyaji Temple in Oya, Tochigi Prefecture, lies a human skeleton, encased in wood and glass. The bones have been undisturbed for decades, one artifact among many in this storehouse of prehistoric pottery, arrowheads and charred animal remains. But recently, a handwritten message was tacked to the skeleton's case: "The oldest Jomon Period skeleton: 11,000 years old by radiocarbon dating. May 28, 1998." Thirty-three years ago, the skeletal remains of this prehistoric human were unearthed almost fully intact in a cave behind the main hall of Oyaji Temple. The depth of the soil in which the remains were found and the age of artifacts found nearby initially led scientists to set the skeleton's age at around 7,000 years. Last year, however, archaeologists at the nearby Tochigi Prefectural Museum in Utsunomiya decided to make a replica of the 154-cm skeleton, thought to be that of a 20-year-old man. Before making the replica, the museum had the remains tested using radiocarbon dating, a widely used method for measuring the age of fossils and archaeological specimens based on the amount of residual radiocarbon in a dead organism. The results of the test placed the skeleton's age at 11,000 years - 4 millennia older than expected. Suddenly, the human skeleton became Japan's oldest from the prehistoric Jomon Period. "Until now, we only had fragments of bones of people from the beginning of the Jomon Period," said Shugi Matsuura, a professor of human biological studies at Ochanomizu University, who carried out the radiocarbon dating process for the museum. "This is the first nearly perfect skeleton we've found. It's in amazingly good condition." The Jomon Period lasted from approximately 10,000 B.C. to 300 B C and was characterized by the cord-marked pottery made by the people of the day. Scientists consider the first 2,000 years of the period - the Incipient Jomon phase - as marking the transition between the Jomon and preceding Paleolithic Period. For this reason, early Jomon artifacts such as the Oyaji remains are considered crucial to unlocking a highly controversial prehistoric mystery: the origin of the Jomon people. The debate focuses on whether Jomon culture - distinguished from the Paleolithic Period due to the use of pottery - came to Japan from northern or southern Asia, said Takura Izumi, a professor of Jomon archaeology at Nara University. "The most common opinion is that Jomon culture came from northern Asia, but many Jomon remains and pottery have been found to have characteristics of the ancient culture of southern China," Izumi said. "Personally, I don't think Jomon culture necessarily entered the country from any one place exclusively. It may have come from both the north and south," he said. Nobuo Shigehara, a professor at Kyoto University's Primate Research Institute who is studying the Oyaji remains said the key to answering the north-south question lies in understanding the connection between the Jomon and Paleolithic periods. In the case of the Oyaji Temple excavation, pottery and tools found at the site are typically Jomon, Shigehara said. The skeleton, however, "is a bit different from that of a Jomon person," he said. "Based on its shape, it seems to fall exactly between the two periods." The bones in the limbs, for example, are slender like those of Jomon people, while the jaw bones - including a set of nearly cavity-free teeth - are extremely sturdy, like specimens from the Paleolithic Period, he said. Still, "there is much more research to be done (on the Oyaji remains)," he said, adding that a DNA analysis may be conducted. For now, the skeleton confirms experts' hunches about the life and society of the Jomon people, said Toshihiro Kaburaki, an archaeologist and curator at the Tochigi Prefectural Museum. "Notice the difference in size between the left and right arm bones," he said. "This is a sign that he had some sickness or disability in life. It may be the reason he died," Kaburaki said. In other Jomon skeletons with evidence of debilitating disease, the advanced age of death and evidence of funeral rites prove that Jomon society cared for its disabled members. 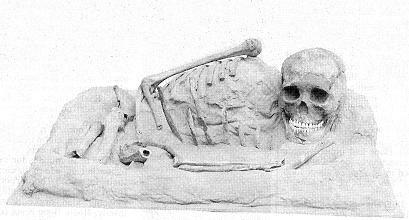 The Oyaji skeleton, unearthed in the fetal position, typical of a Jomon burial, reflects this care. "Jomon society looked after their disabled" rather than casting them out, Kaburaki said. Jomon people also tended to bury their dead in the middle of their villages, supporting the theory that the cave where the Oyaji remains were excavated once provided shelter for generations of Jomon people, he said. 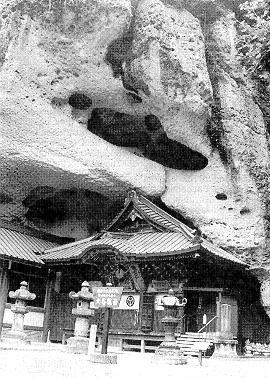 Today, the cave forms the back wall of the temple's main hall and serves as a sanctuary for several ninth century Buddhist sculptures that were carved into the rock face when the temple was founded. Head priest Keichu Takahashi said the number of visitors to the small-town temple has jumped since word got out that scientists the country's oldest Jomon skeleton there. However, Kaburaki cautioned that despite media reports, the true age of the skeleton remains a mystery. "The original, 7,000-year age estimate is based on an archaeological investigation of the soil layering and pottery found at the site, and cannot be ignored," he said. "Over time, soil entered the cave and piled up over the ruins. There shouldn't have been any more shifting of the layers of soil after that," Kaburaki said. But Ochanomizu's Matsuura stressed that radiocarbon dating provides accurate results, perhaps more so than dating determined by layers of soil. "Layers of soil are not clearly divided, as you would see in a textbook illustration. Over time, disturbances will occur," he said. In addition, Matsuura said, pottery from the Incipient Jomon phase was found in the soil underneath the skeleton, indicating someone was undoubtedly living in the Oyaji cave 11,000 years ago. Kaburaki agreed that pottery from the Incipient Jomon phase makes the 11,000-year figure a realistic possibility. Temple priest Takahashi has no doubts. "The way I see it," he tells visitors to the temple, "This guy just got 4,000 years older."